Fruit salad is a delicious dessert and easy to make within few minutes, we can make fruit salad in various ways but Here I mixed fresh fruits with Butterscotch Ice-Cream you can use any flavor, you can also use Dried fruits or Chocolate Chips as its topping to give it even more richer taste. Garnish it with tutti fruity, Optionally you can add Mixed fruit Juice with Fruit salad to help bring out its fruity flavor. Before selecting the fruits make sure that the Fruits are ripe otherwise you can add Sugar, Honey or Caramel syrup for more taste. Onion Bonda is a crispy, yummy and tempting appetizer, which is a popular evening snack in South India particularly in Tamil Nadu and Andra. Hot bonda with monsoon or winter will be a perfect choice. 2 1/2 cups Chickpea flour/Besan/Kadalai mavu. 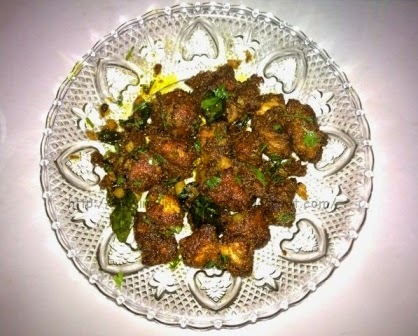 In a bowl add finely chopped Onion, salt, Besan flour, Rice flour, Red chilli powder, Baking soda, Salt, scratched green chilly, finely chopped curry leaves and Asafoetida then add some water and mix nicely in thick batter consistency without making lumps. 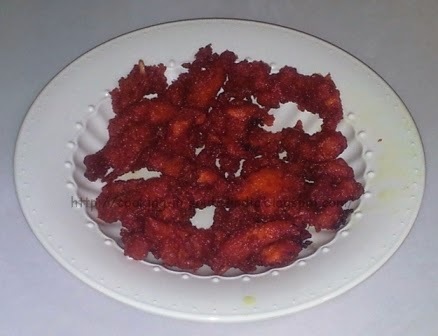 Heat oil in a fry pan in medium heat, when it gets hot using the spoon drop a small ball like portion directly into the hot oil, fry in oil until the Bonda become golden in color. Serve hot with tomato ketchup or any chutney. which is perfect monsoon delight. For know the perfect thickness of batter consistency see the above attached Picture. 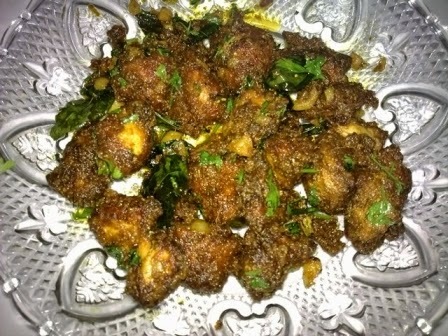 Hyderabadi chicken 65 is a popular Hyderabadi recipe which is rich in taste, there are different stories about the name of the dish chicken 65. To this mixture add the fried chicken mix well until the chicken absorb the curd well. Garnish with Coriander leaves and Curry leaves and Serve hot. Appam is delicious and easy breakfast recipe, which is popular in south India particularly in Tamil Nadu and Kerala. After the batter fermented add salt mix it well. In an appa kadai(deep non-stick pan) pour the batter and spread the batter thinly then close the lid. cook it well (No need to add oil if you are using Non-stick kadai). Serve with Sweetened coconut milk. Coconut milk is ready to serve with Aapam.